I got back from an amazing trip to Boston and Cape Cod this afternoon! I had a blast with my family, but totally missed my husband who was unable to come. He is amazing and while I was away redid the floors and painted our bedroom (pictures to come)!! 1. Preheat the oven to 350 degrees and spray or grease a Pyrex baking pan. Any size pan will work as long as it can fit your roll ups. 2. 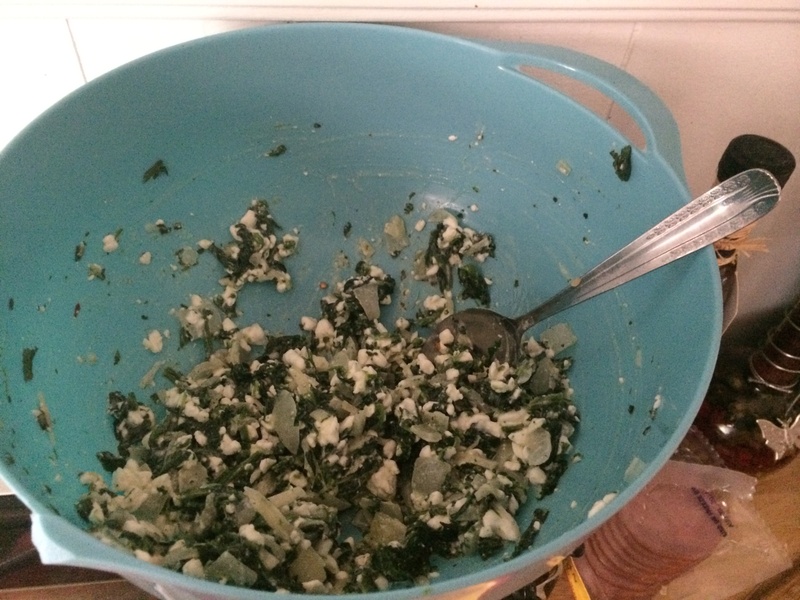 Sauté onions and garlic to get a nice flavor going and then add about 1/2 a bag of frozen spinach. Season with your favorite spices. 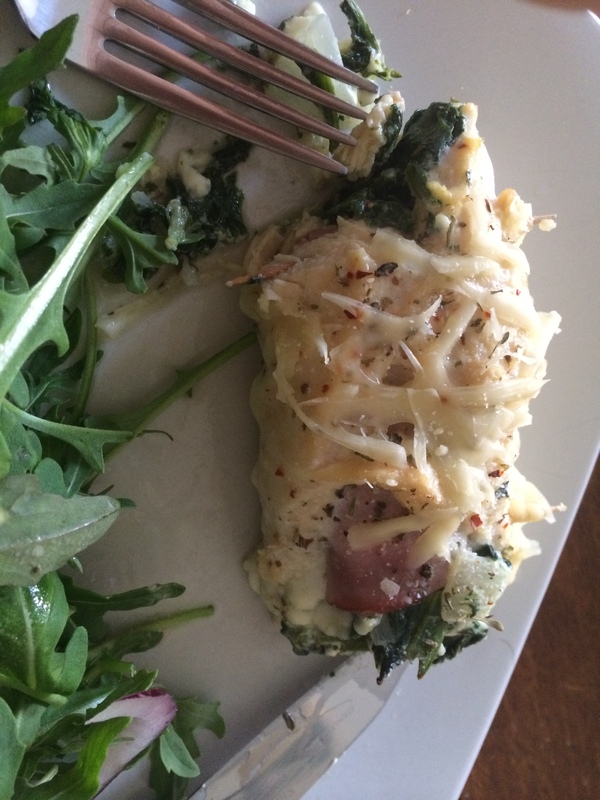 Tweak this step based on how you like your spinach! 3. 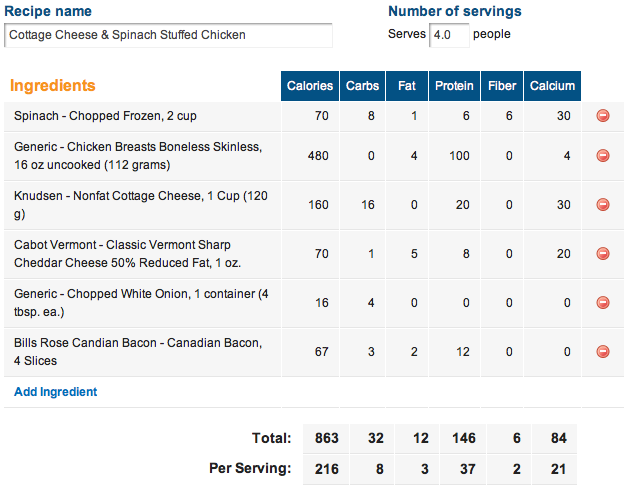 Once the spinach is cooked (and tasty) dump it into a bowl and mix with about 1 cup of cottage cheese. 4. Next you’ll want to prepare the chicken. I am not at all good at “butchering” meat, but here’s what I did. I trimmed all the fat from each breast. Then I “butterflied” the breast to the best of my ability. I also pounded the chicken a bit to thin it out. 5. This is the fun part! Cut each butterflied breast in half to make 4 different pieces. Season the chicken with salt, pepper and any other chicken seasoning that you enjoy. 6. Place the Canadian bacon on one end of the breast and a scoop of filling in the middle. 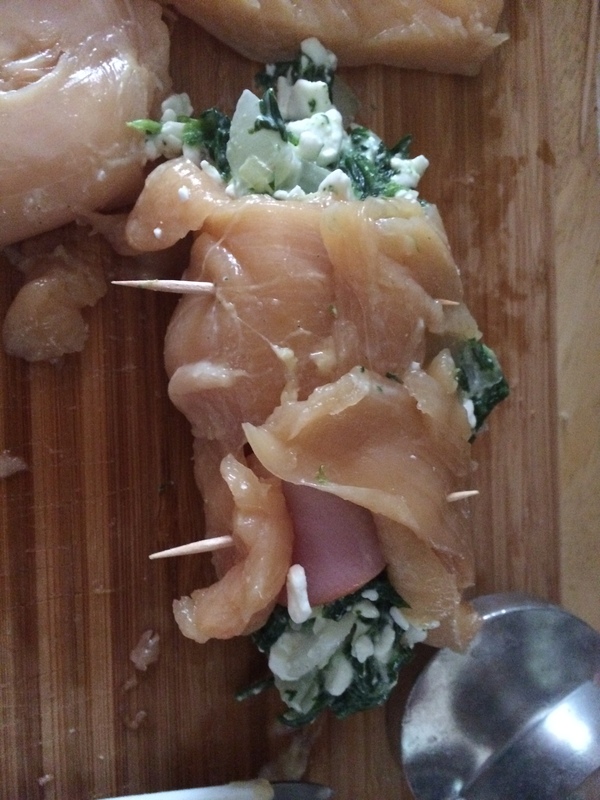 Roll the breast and use a toothpick to hold it closed. 7. Place each “roll up” into the greased Pyrex. I found it easiest to use a spatula. I also sprinkled some more seasoning (I used italian seasoning) and shredded cheese on top. 8. Bake for about 20-25 minutes or until the chicken is cooked through. It should be golden brown and the cheese should be melted. I almost forgot to take a picture of the final product before it was gone! 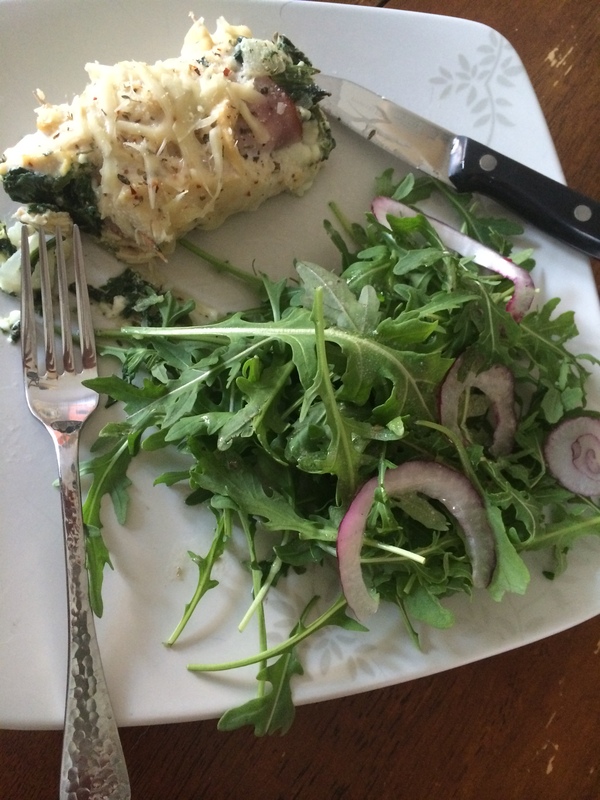 I served with arugula salad (yum!). Enjoy! I promise I will get better at taking pictures as I go! This chicken was so tasty and simple to make, but super healthy too. I hope you give it a try! I used to hate cottage cheese but have learned to love it! What’s your favorite cottage cheese recipe? Previous Want to Learn How I Paid Off $50,000 of Debt in 1 Year?